Sharif Mahmud Khalid is an Assistant Professor (Lecturer) at the Sheffield University Management School, University of Sheffield. He has a major interest in corporate governance and social responsibility practices approached from a critical and interdisciplinary perspective. He has a particular interest in African development. 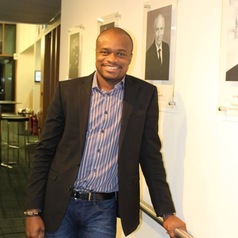 He completed a PhD from the Henley Business School, University of Reading. Stakeholder engagement, accountability, transparency, social and responsible investments, ethical and environmental concerns of the extractive industry resonate around his research interest. He has a strong interest in what his terms the corporate governance and CSR surrounding the Sino-Africa 'barter', where Africa's mineral resources feed China's demand for raw materials in exchange for infrastructure, concessionary loans and grants. Sharif currently sits on the Executive Steering Committee of the British Accounting and Finance Association Special Interest Group on Corporate Governance. He is also Fellow of the Higher Education Academy, UK.